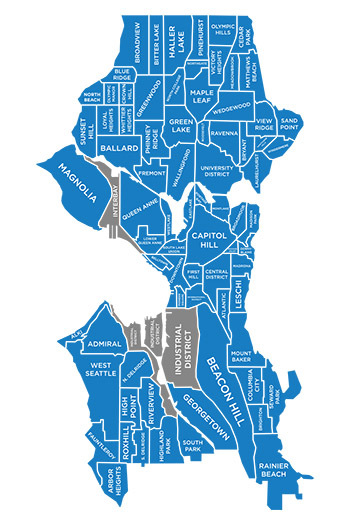 Located in the northwestern part of Seattle, Ballard is historically known as an industrial neighborhood with fishing, shipping and manufacturing roots. In its early years, the neighborhood attracted many people from Scandinavian countries, and now celebrates its rich Nordic culture which is ever present in annual festivals, as well as in the Nordic Heritage Museum located on Market Street. Through the years, Ballard has transformed itself into a contemporary waterfront neighborhood with trendy restaurants, bars, craft breweries and live music venues all located around the historic district of "Old Ballard." Just a short walk south and you'll see one of Seattle's top tourist attractions, the Ballard Locks, which transfers record numbers of boat traffic in and out of Lake Union. From there, you can enjoy views of iconic Salmon Bay. Homes in Ballard range from one-bedroom apartments to modern, new townhomes. South of NW 65th Street, you will find mostly large and small apartment buildings and townhomes, whereas north of 65th there are more traditional Seattle homes such as Tudors, craftsmen and cottage style bungalows. Due to the popularity of this neighborhood, a number of NW contemporary new construction homes and townhomes are also being built. GILMAN PARK 1ST ADD E 1/2 OF 1-2 & S 20 FT Bldg. Leary ADD to Ballard Bldg. Courtesy of Ballard Realty, Inc.